Heat 1 tablespoon olive oil in a roasting pan over medium-high. Add shallots and cook until they are translucent. Add in the garlic and thyme; cook for about 30 more seconds. Add the spinach and cook until wilted. Remove from heat. In a small bowl, combine the goat cheese, chives, parsley. Holding knife flat and parallel to cutting board, cut horizontally through center of pork loin, cutting to, but not through, other side. Open flat, as you would a book. Starting at the center seam, cut horizontally through each half, cutting to, but not through, other side. Open flat on either side. Place pork between 2 sheets of plastic wrap; pound to an even 1/2-inch thickness using a meat mallet or small, heavy skillet. Remove plastic wrap. Season with salt and pepper. Spread goat cheese mixture evenly over pork; top with spinach mixture. Roll up pork jelly-roll fashion. Tie with kitchen twine at 1-inch intervals. Season the outside with salt and pepper. Heat roasting pan with more oil over medium-high. Add pork; cook until well browned on all sides. Place in a 375 degree oven for about 1 hour or until the internal temperature reaches 140 F.
In a saucepan on the stove, add the apricot preserves, butter, and mustard. Cook over medium heat until the butter melts. Place pork on a cutting board; let stand 10 minutes. 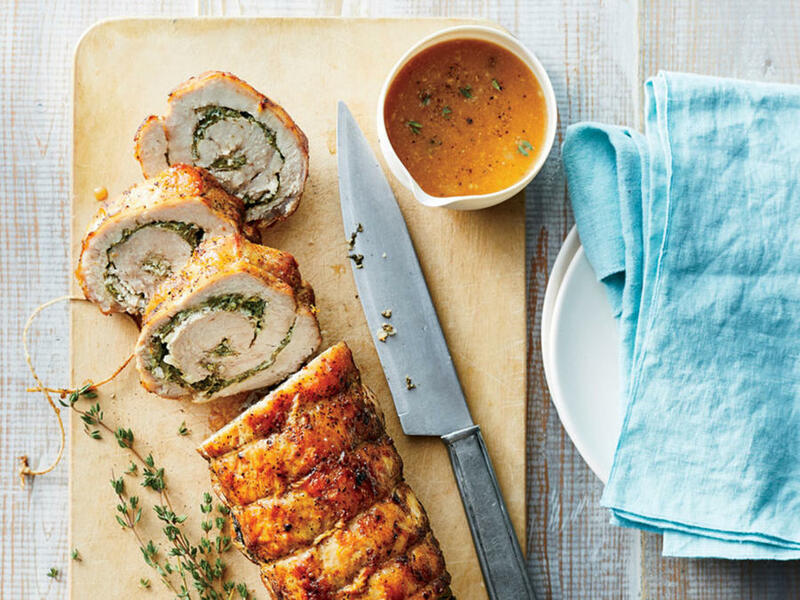 Slice thickly and serve with the apricot sauce.